With our 'SINOVO Connection Center' it is possible to transfer the data from the devices supported by SiDiary directly to Microsoft® HealthVault® and make your data availabe in your personal healthcare records from more than 150 blood glucose meters, insulin pumps and so on. Once you have created an account at Healthvault you can select 'Get more apps' from the start page to download the Healtvault Connection Center and install it on your PC. 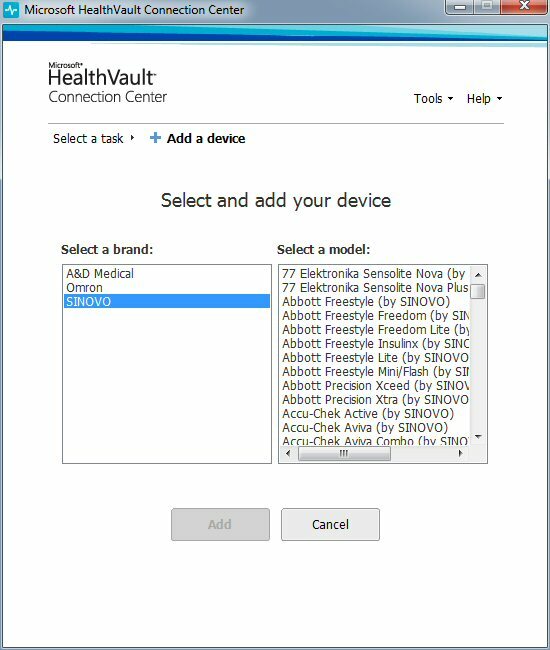 If you have started the Healthvault Connection Center on your PC you can start 'Add a device' to select all devices from which you want to upload data to your Healthvault records. The Healthvault Connection Center downloads the necessary software automatically from the SINOVO Connection Center and you can start to read your devices and upload the data.